This week we are headed to Japan for our ornament inspiration. 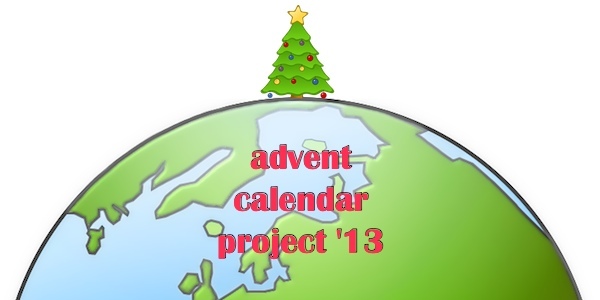 Christmas is not widely celebrated in Japan as most people are not Christian. But some traditions like sending Christmas cards and presents have caught on. Santa brings children presents (though once someone stops believing they no longer get presents). It is thought of as a time to spread happiness and romance and is a bit like our Valentine’s Day. People tend to celebrate on Christmas eve as Christmas is not a national holiday and most businesses are open as usual. Fried chicken is the popular Christmas dinner with KFC being a popular option and Christmas cake is a must. Many families have a Christmas tree, though not a live one. 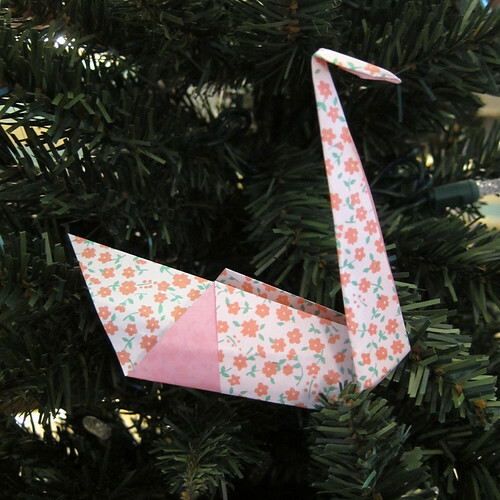 The most popular ornament is an origami swan. 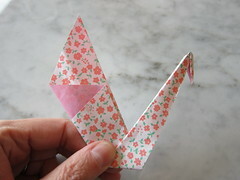 I have never done origami before and the swan was a really easy one to start with. 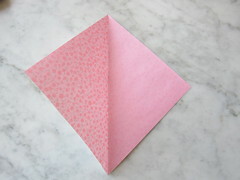 I used a pretty pink floral paper as I thought it suited the Japanese idea of Christmas being a romantic time. 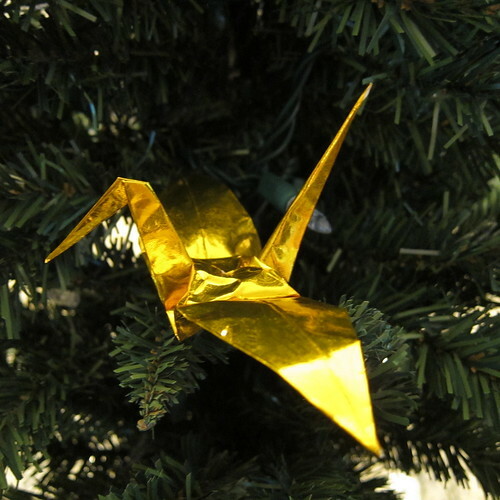 It would also look really pretty done with a foil paper like my husband did with this crane. 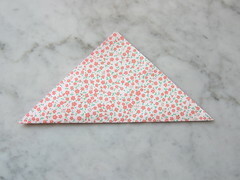 This is easiest enough that kids can help fold them too. 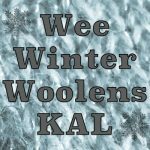 Click on any of the pictures in the tutorial to see them bigger. 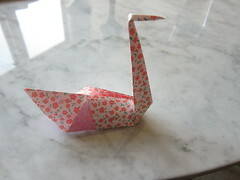 square sheet of paper, I used a 5 7/8 square of double-side origami paper, but swans look beautiful in plain white too. 1. 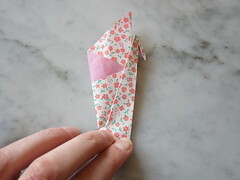 Fold the paper in half diagonally. 2. 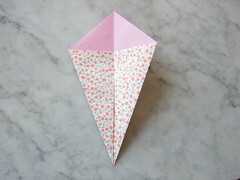 Open the paper up so you have points at the top, bottom and sides with the crease down the middle. 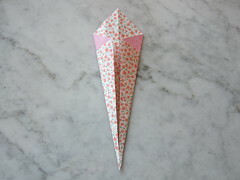 Fold the the side corners in to the center line to get a kite shape. 3. 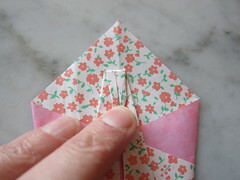 Turn the paper over and fold the sides into the middle crease again. 4. Fold the bottom point up to meet the top point. 5. 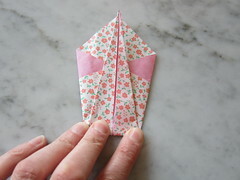 Fold the front point forward about 1/2″. 6. 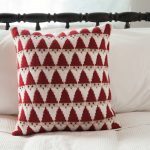 Fold everything in half at the center crease. 7.Pull the head end forward to your desired angle and pull the beak out a bit. And you have a swan! I find these ornaments look best just nestled into the tree though you could add a hanger.